Have you ever seen the post I did a while back on the shoes I've said goodbye to and regret it? (HERE) Well these shoes need to be added to the list. 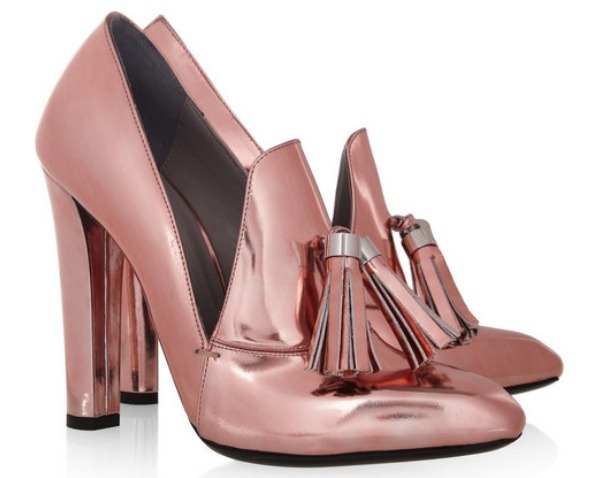 These gorgeous pink heels are Alexander Wang Anais. They came in blue, black, silver, and this amazing pink. From the mirror like finish to the fun tassels on the front these shoes are the perfect example of a glamorous loafer. Being the cheap, poor, stubborn person I am, I tried to wait and hold off for these to go on sale and sadly missed them and never got my pair. I will forever be on the hunt for these but till I find them they will have a place in my "shoe" heart. What shoes do you regret not buying?